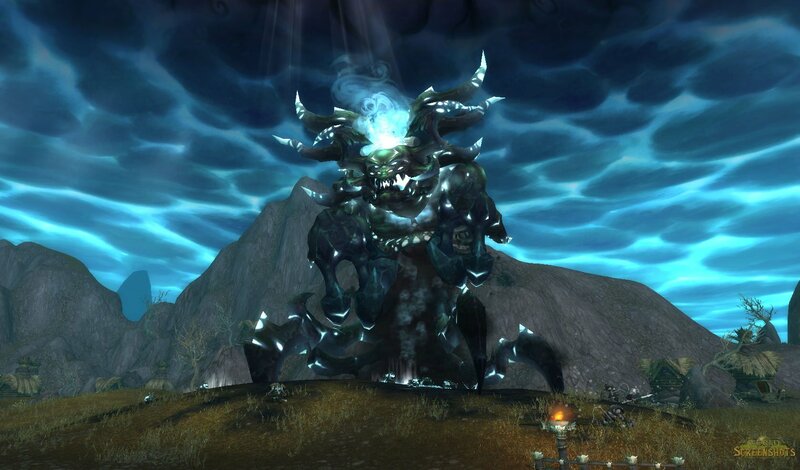 Welcome to the fourth blog post in the “Warcraft Community’s Top Things To Do Before WoD” series! No one could say that we don’t get invested in our own characters. Just taking a look at our blog and the blurb for our own toons, let alone all the other members of the community! I hope Sugar&Blood doesn’t mind me mentioning their blog here, as they have a perfect array of Draenei’s. Or there’s Ikralla who clearly loves the Pandaren! Not to mention, of course, the 100’s of days /played we all have, it’s not surprising that our characters were suggested as one of the reasons to keep coming back to Warcraft. We have never dabbled in this particular hobby, but as it was suggested I wanted to include it. RP-ing seems to follow naturally from the identity and relationship we form with our online characters, so how about giving it a go? Haris Pilton – if you buy the bag she has available for an exorbitant amount of gold, you even get an achievement! The adorable Lunk – if you haven’t done this quest line, you totally should. Bambina, Flora and Thudder. Clearly a reference to Disney. I love that. A lot. Elloric, husband of Twitter’s very own @GhemitHunts. We don’t know Ghemit that well, but we remember his raw pain sadly and we visit Elloric, who lives in one of my favourite places (above MSV in the library/archaeology place), often. Finally, in-game memorials. We think it’s wonderful that Blizzard puts these into the game and to understand the context of each gives them the deserved respect. The video below is worth watching! You know, one of the most annoying things e.v.e.r. happens to me almosy daily? I would go so far as to say I wish they would globalise those auto-dismount mage-type bubbles they have around the quest givers on the Isle of Thunder. 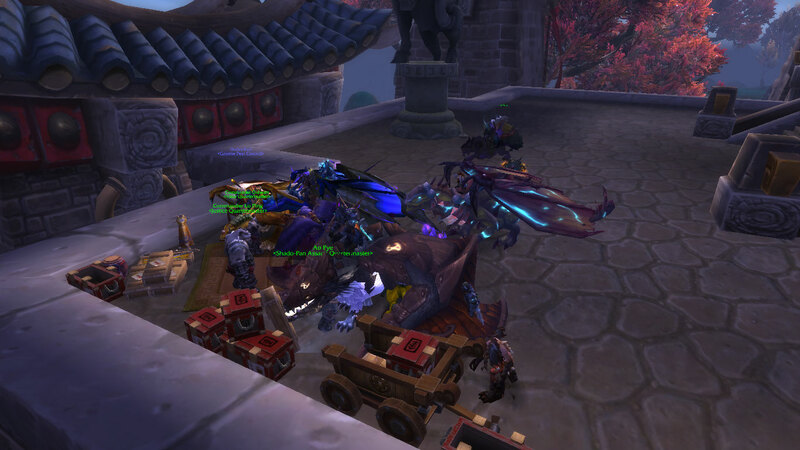 If only people used their brains and dismounted so everyone could access the NPC… I would have nothing to moan about. Nothing to moan about… Imagine that! Sorry for not posting a moan last Monday – we were out visiting family. This week, it’s all about NPCs. I always end up clicking the NPC by mistake in the middle of a stupidly large pull, then not being able to get rid of the quest page that pops up. 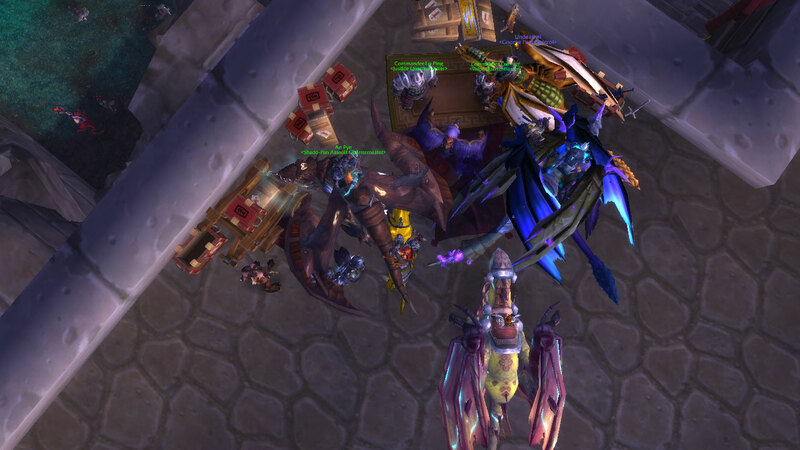 Or, I end up pulling large amounts of mobs because I land and can’t see because the stupid thing is in the way. The worst, as in the pictures, I think is Shado Pan. The kite flies really close, there’s lots of mobs close together, and even on land they’re just TOO close. Incidentally, the set of NPCs in the Firelands dailies – at Sethria’s Roost – they are a perfect distance away and don’t interfere with game play at all.